The Blue Mountain's Grand Canyon Track showing off some mind-blowing views. The Top 10 unforgettable walks and adventures is part of our special issue: 100 Incredible Experiences (right here in your backyard). From alpine peaks to red desert and rainforest, the walks and adventures here are a testament to the diversity of landscape that we have in Australia. If you even manage to do half of what’s on this top 10, you can say that you’ve seen some of the most remote, spectacular and wild places on the planet, and some of this country’s pristine World Heritage areas. There is something for everyone, from epic wilderness expeditions to easily accessible day-long walks. Bridle Gap hike dissects the magnificent Wilpena Pound (photo: Elise Hassey). While there are many walks you can do in and around the geological wonder that is Wilpena Pound, this one takes you right across its floor from the top of one side to the other. Part of the famous 1200-kilometre Heysen Trail, it’s a six-hour return hike across 19 kilometres. The floor of the Pound is a bird-lover’s dream with a variety of raptors and parrots, wrens and robins making their home among the native pines, eucalyptus and heath. Walk highlight: the view of the mountain-ringed natural amphitheatre from bridal gap. 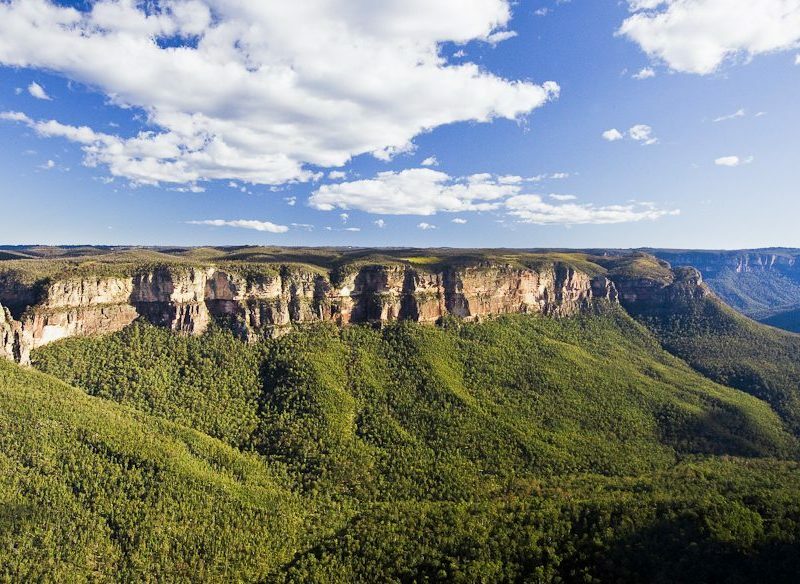 The Blue Mountains National Park is an arresting wonderland of verdant forest surrounded by giant sandstone buttresses. A six-kilometre loop that leaves from near the quaint village of Blackheath at Evans Lookout, the Grand Canyon Track affords mind-blowing views of Grose Valley. The trail takes you along the clifftops of the Blue Mountains dropping down into sub-tropical forest, beautiful Beauchamp Falls and fern-filled prehistoric gullies. The Grand Canyon itself is a 180-metre deep cut through the sandstone and makes for a dramatic ascent out of it to complete this short four-hour, yet epic, journey. Have a bike licence? Then this is a journey you have to make. An eight-day guided trail-bike ride takes you on and off road from Cairns to Cape York, through the ancient Daintree Rainforest, into Cooktown, and up to the northernmost township of Seisa. From here you make your way to the tip of Australia on sandy tracks and stretches of beach. It’s an adventure of bucket-list proportions and the best way to see this part of the world, much of it only accessible by motorcycle. Try the likes of Cape York Motorcycle Adventures or Fair Dinkum Bike Tours. Adventure highlight: After a day in the saddle, the sight of Eliot Falls is like a mirage; a spectacular wild swimming spot. Strolling the beach at Lockhart River on Fraser Island’s Great Walk. The world’s largest sand island should be something of a pilgrimage for Australians. Fraser Island is a paradise of white beaches and over 100 freshwater lakes including the spectacular Lake McKenzie, mangroves and rainforest-lined creeks, all of which have given it World Heritage status. The six- to eight-day, 90-kilometre Great Walk takes in the best of the island, from the towering forest known as the Valley of the Giants to the famous swimming hole that is Lake Wabby. This route is fast becoming the must-do walk in the country, taking you into the remote desert from Alice Springs to Mt Sonder. You’ll stride out across vast flood plains, along the dramatic ridges of the West MacDonnell Ranges and through spectacular canyons. Walk the whole 223 kilometres of the Larapinta, which takes 15 to 16 days, or simply do a day section, like the Mount Sonder Return or Counts Point Return. Along the way you’ll admire rare desert flora and spot black-footed rock wallabies. Walk highlight: Simpsons Gap is a dramatic red-rock passage sheltering a welcome waterhole. An absolute privilege: swimming with Ningaloo’s whale sharks. It’s something of a privilege that one of the biggest animals on the planet makes an annual migration to our waters. From April to July, whale sharks congregate on the World Heritage Site of Ningaloo Reef, providing a once-in-a-lifetime opportunity to snorkel with the largest fish species in the world. A boat will keep you fed and watered out on the reef while spotter planes identify the harmless sharks cruising the ocean. You’ll then be dropped off to swim with the gentle giants. Adventure highlight: the adrenaline rush of seeing the massive form of a shark approaching. Mt Bogong showing what the Alpine National Park has to offer. To witness perhaps Australia’s most unlikely landscape, that of its alpine wilderness, you have to get up into the mountains. Now you can walk the entire length of the 650-kilometre Australian Alps Walking Track to achieve this, or you can cheat and do a fairly arduous one-day walk that takes you up into the high plains and the summit of Mt Bogong (‘Big-fella’, in Aboriginal tongue), Victoria’s highest at 1986 metres. The trail starts at the Mountain Creek picnic area and follows a steep 16-kilometre route known as Staircase Spur. You’ll pass through beautiful peppermint and snow gums before reaching the top of Mt Bogong and some awesome views of the Alpine National Park. There’s no better way to see the wilderness of Cradle Mountain than by walking the Overland Track. Tasmania’s wilderness is a World Heritage Area, and there’s no better way to see it than on this 65-kilometre, six-day walk. A once-in-a-lifetime trek, in the walking season from October to May you make your way from the base of Cradle Mountain to Lake St Clair passing through ancient rainforests, glacial valleys, meadows and a dramatic skyline of peaks. This walk is popular; you’ll need to book in advance to walk in the summer months (advisable!) staying at campsites and huts along the route. Walk highlight: The Overland is ripe with side-trips; take your time, go off the beaten track and make an ascent of Mt Ossa, Tasmania’s tallest at 1617 metres. Sand ahoy… traversing the Simpson Desert is a once-in-a-lifetime affair. Some of the most beautiful places in the world are special because they are notoriously hard to get to. And we have one right in the heart of the country: the Simpson Desert. Now the only way to witness this spectacular landscape, which places 1100 red, rolling dunes in your sights is to get a seriously kitted-out 4WD and drive across it. And even then you’d need to be something of an off-road expert. It’s an expedition of epic proportions, taking four days, and you’ll need to be self-sufficient with fuel, water and food for seven days on top of your schedule, and have a healthy dose of outback nous to boot. Unless you’re the 4WD equivalent of Mick Dundee then we suggest joining a tour and let the experts take the wheel; for instance, Tagalong Tours runs a 12-day adventure into the Simpson. Adventure highlight: Tackle the slopes of Big Red, or Nappanerica, the largest sand dune in the Simpson at 40 metres high. Rafting World Heritage style on Tassie’s Franklin River. Join a rafting expedition down the Franklin River, and you’ll spend more than a week negotiating its wild rapids, tranquil stretches ripe for a swim and sections that take you through ancient forest that would be impossible to reach otherwise. Franklin River Rafting runs eight-day expeditions, setting up camp in spectacular gorges along the way. Adventure highlight: Being so remote in a World Heritage Area gives you that rare sense of being an intrepid explorer.